As he was getting ready for bed one night in October 2015, Adam DeMaioribus came down with the worst headache of his life. The pain was so intense that it made Adam nauseous. He popped four ibuprofen tablets but threw them up. Adam was only 34 years old and relatively healthy with no history of high blood pressure. He certainly didn’t fit the classic profile of a stroke victim. But as the night wore on, Adam’s wife, Tina DeMaioribus, grew increasingly alarmed. Adam fell four times trying to walk to the bathroom of the couple’s south Huntsville home and didn’t have the strength to get up. Tina wondered if he had been stricken by Bell’s Palsy, which causes temporary facial paralysis. “She could see that the entire left side of my face was starting to droop,” said Adam. With Adam’s headache still throbbing after several hours, Tina called 911. As they waited on the ambulance, the couple’s Lab-husky mix, Sushi, walked up and began licking the right side of Adam’s head. Paramedics rushed Adam to Huntsville Hospital, where tests confirmed he had suffered a massive hemorrhagic stroke on the right side of his brain. Blood from a burst or weakened blood vessel had flooded his skull, causing swelling and extreme pressure. A nurse asked Adam to rate his pain on a scale of 1 to 10. “I told her it was an 11,” he said. Physicians raised the possibility of an emergency craniectomy with Tina as well as Adam’s parents, Mike and Leta DeMaioribus. That’s where surgeons remove part of the skull so a swelling brain has room to expand. “They said it was the biggest brain bleed they’d ever dealt with,” said Adam. Fortunately, Adam’s brain began to slowly re-absorb the pooled blood. As the pressure inside his skull subsided, emergency surgery became unnecessary. Still, Adam had lost control of the left side of his body and faced a daunting recovery. He spent about three weeks in Huntsville Hospital’s Neuro Intensive Care and Neuro Progressive Care units under the supervision of neurosurgeon Cheng Tao, MD, and hospitalist Daniel Wade Fox, MD. He was then transferred to HealthSouth Rehab Hospital, also located on the hospital campus. Adam isn’t taking his good fortune for granted. He knows the statistics: Anyone who has had a stroke faces an elevated risk of additional strokes. To improve his odds of staying healthy, Adam has greatly reduced his consumption of red meat and stopped drinking alcohol. He’s also eating more fish for the Omega-3 fatty acids, which have been linked to improved brain function. Tina is amazed by Adam’s recovery. His condition on the night of the stroke was so dire that doctors feared he might not survive the night. “They were just trying to be real with me, but I told them, ‘My husband will walk out of here,’” said Tina. 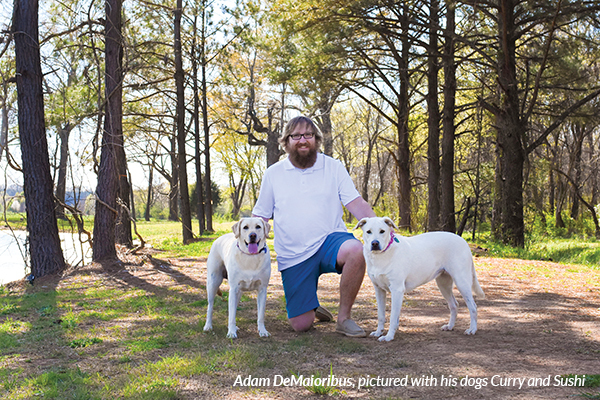 “And when we left HealthSouth about six weeks later, Adam walked over to the Neuro Unit. The nurses started crying when they saw him come in under his own power.